NEW YORK – March 28, 2018- The PAW Patrol pups are ready for warm-weather fun in the new DVD collection PAW Patrol: Summer Rescues, available May 1. Whether they’re tracking down missing fireworks or embarking on a wacky windsurfing rescue, the pups are always ready to save the day under the summer sun. 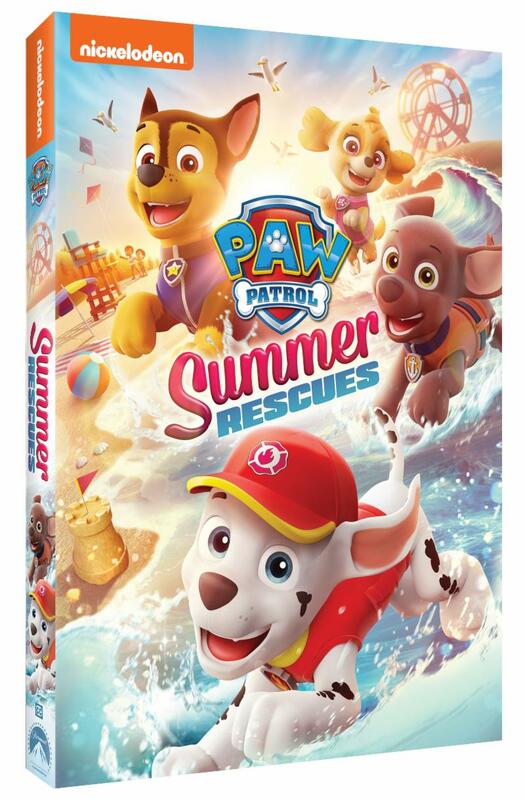 Produced by Nickelodeon Home Entertainment and distributed by Paramount Home Media Distribution, PAW Patrol: Summer Rescues will be available on DVD May 1 for the suggested retail price of $10.99. Pups Save the Fireworks – Ryder and Marshall track down the missing Adventure Bay Day fireworks, while Chase and Skye round up the piglets that were delivered by mistake. Pups Save the Carnival – Cornelius the pig is causing chaos at the carnival and all of the prizes have vanished too. It’s up to the PAW Patrol to rescue the missing piggy and prizes. Pups Save a Ferris Wheel – The PAW Patrol have a “wheel” problem on their hands when Mayor Humdinger tries to steal Adventure Bay’s new Ferris Wheel. Pups Save a Camping Trip – A cool camping trip turns into a risky rescue when the pups work together to save Chickaletta from a ravine. Pups Save Dude Ranch Danny – Chase and Skye search for Daring Danny X after he takes his horse on a wild off-trail ride through the desert. Pups Save the Chili Cook-Off – Rocky and Rubble must work together to fix Mr. Porter’s stove after it explodes at the big Chili Cook-Off. Pups Save a Sleepover – When Farmer Al’s animals go missing during a sleepover, it’s up to the PAW Patrol to rescue them before a big storm arrives. Pups Save a Windsurfing Pig – When Farmer Al’s pig Cornelius goes windsurfing, the PAW Patrol must set sail to bring him back to shore.